"Excellent purchase at #Stockports @Vintage_Village yet again!" "Amazing abstract 60s statement bangle from Mr Vintage." [Editor's note: our Mr Vintage may now have changed his business name to The Grand Collector. Will confirm as soon as I know for sure]. "Today's haul @Vintage_Village from @PenelopeCatVtg, @snyggstyle, Lonsdale Ave, All Our Yesterdays and @EclectaBooks"
[Editor's note: Motoring Atlas from Lonsdale Avenue]. "At @Vintage_Village the ladies from Stockport Hat Museum told me they would find a hat that suited me. They failed." 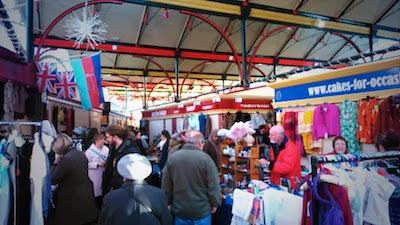 "@Vintage_Village Stockport best vintage market I've been to and amazing selection of products! Well worth the visit!!" "Lovely treasure from this Novembers fair at Vintage Village at Stockport Market Hall . Brown flowery table cloth from The Side Room , a lovely double fringed throw from Memories are made of these , ditsy flower fabric from Village Vintage Clothing and finally my best item, a fab chopping board which I will hang on my wall." "Totally worth my trip to @Vintage_Village just to get my @STCakeDesign exclusive bag (...and cakes of course) :)"
"From yesterday's VV: 70s plastic necklace from Bluecat Jewellery. Looks summery, but I'll wear it now!" The sun had got his hat on for our Hats Fair! Which was awfully lucky for us because the previous day was blighted by vicious hailstorms (yes, weather is an obsession for me). A gratifying number of visitors and stallies donned their best hats for the occasion, and enjoyed the fine display of beautiful vintage motors from 3 Graces Northwest Classic Car Club, as well as fabulous DJ trio Girls Gone Rockin', the wonderful Sunderland Street Skiffle Group and the ukelele-powered Willy and the Poor Boys. In fact, Willy and the Poor Boys also did us proud by serenading birthday girl stallie Anne Langton with an enthusiastic rendition of "Ain't She Sweet." Most touching! Oh yes, and we all did a bit of vintage shopping. It's a smaller gallery this month, but no less choice. As ever, our fervent thanks to everyone who took the trouble to share their delightful photos online, and if you'd like to contribute just post your pictures on Twitter @Vintage_Village (don't forget the underscore!) or on our Facebook page. And don't miss Alex of Snygg's marvellous Finds of the Fair, and our album of photos of the day, taken by photogenic young photographer Frankie Cooksey. "Today I found the perfect (faux) fur coat @Vintage_Village. My life is complete #snuggly"
"I have been buying Pyrex and edible Christmas tree decorations, oops!" "My buys @Vintage_Village today: rocker from @OoohBettyLoves, dolls house bits from Wayne All Our Yesterdays"
"My treats from yesterday's VV Fair: 70s/80s dinky tin money box from Lonsdale Avenue." "@Vintage_Village found soooomany nice things!Good thing for my wallet it's only once a month!That's my favourite buy"
"@Vintage_Village @MissObina @MsBethTaylor @mabelandbean Here's my beautiful new handbag. :-)"